The company has a lot going for it, but its valuation is high compared with other manufacturers. Too high to invest? Sometimes, you have a gut reaction to a stock's valuation. "It feels low," you say to yourself, or "It sounds too rich." But of course, the only way to know for sure is to do some digging. That's why, after hearing that the P/E ratio of industrial heavyweight 3M (NYSE: MMM) was above 22, I decided to look more closely into things. Because to me, a P/E of 22 feels high -- but maybe for 3M, it's right on target. When assessing a company's valuation, it's helpful to compare it to the valuation of its peers. The trouble is, it's difficult to assign a "peer group" to 3M. On one hand, it's definitely an adhesives company, with its Duct Tape, Scotch, and Post-it brands. Other major adhesives companies, such as The Gorilla Glue Company and ShurTech Brands, maker of Duck Tape, are not only privately held but also much, much smaller. The company has a robust materials-sciences business, which might put it in the same class as chemical companies DuPont (NYSE: DD) and Dow Chemical. But that, too, ignores its large consumer-products division. Many analysts lump it in with industrials such as General Electric and Honeywell International (NYSE: HON). 3M's size and diversity are certainly comparable to these other conglomerates, and it even operates in some of the same sectors -- aerospace and healthcare, for example. But 3M deals in much smaller-scale items. You'd be hard-pressed to find a 3M product that wouldn't fit in a shopping bag. 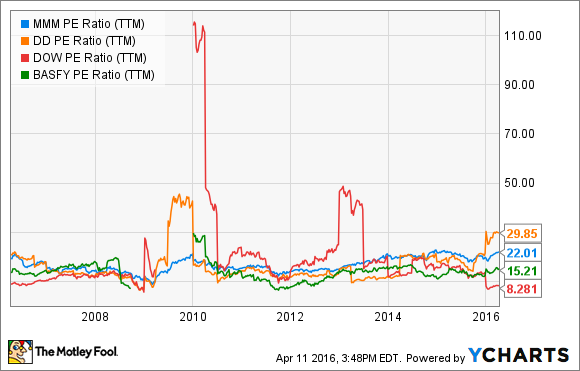 So let's take an "all-in" approach and look at 3M's valuation against each of these other groups. 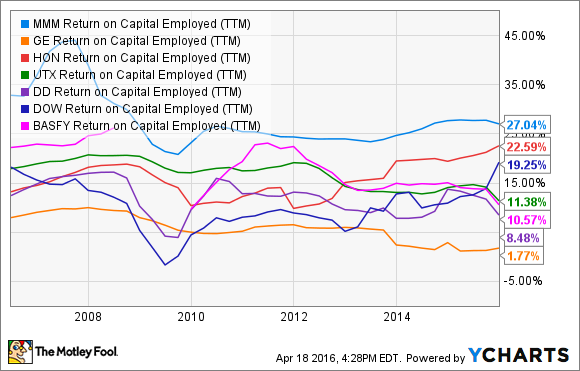 Generally speaking, 3M has been at or near the highest valuation among these companies for a decade (Dow's wild jumps notwithstanding). Moreover, 3M's P/E has been the most consistent of the batch. That said, although it has been hovering right around 20 for a couple of years now, its current valuation is higher than its 10-year average. As you can see, the picture is mixed. 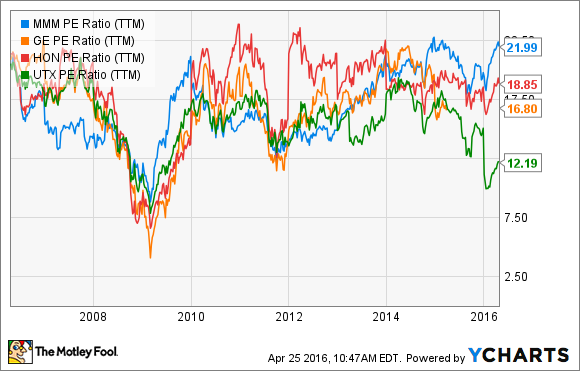 3M is seldom in the middle of the pack: it usually either has the highest P/E of the group...or the lowest. While its current P/E of about 22 is its highest since 2005 it saw much higher valuations in the decade prior. Based on this data, 3M doesn't seem to be a value proposition...but neither is it definitely overvalued. This raises some serious concerns that the company may be overvalued, particularly when coupled with a negative tangible book value. However, for 3M, that's not the case. 3M has been repurchasing its stock more rapidly than it has been growing its profits. That's a good sign, since it means the company is churning out free cash flow in excess of earnings. But all those share repurchases have artificially lowered the company's book value, which is why the price-to-tangible book value ratio looks so high right now. 3M's already-high return on capital employed has been trending slightly upward since 2013, and right now sits at an impressive 27%! To put that in context, only three of the other companies on the Dow (Apple, Home Depot, and Nike) currently have a higher ROCE. Naturally, investors will be willing to pay a premium for those kinds of returns. . Your gut may tell you that 3M is overvalued with a P/E of 22, and there's a good reason for that: Its valuation is indeed higher than many of its "peers." But historically, that's always been the case, so there's no reason to think it will be a particular problem now. The company's stellar ROCE, though, seems to justify that higher valuation. So while the company may not be "undervalued," per se, it's certainly not overvalued. Value investors should feel relatively safe that they are buying 3M for a decent price.